Your cat’s coat appears messy or unkempt within 24 hours. Fur sticks out at odd angles and looks clumpy or dull. Your cat fails to lap or wash her face which leaves dried food debris around her mouth. The area under your cat’s tail, is soiled by feces or urine. Make sure you report any change in grooming behavior to your veterinarian as soon as you notice it. They can help make sure your cat receives the best care possible. Your cat’s coat is thick, dull, and more prone to mats. Nails that look thick and dirty at the base of the nail. Thick overgrown nails can curl around and pierce your kitty’s toe pad. Urine and/or feces on the skin and fur under your cat’s tail. Litter stuck to your cat’s paws. This occurs when your cat is urinating more than usual and can be a sign of diabetes or chronic kidney disease. Mats in their fur on their lower back. 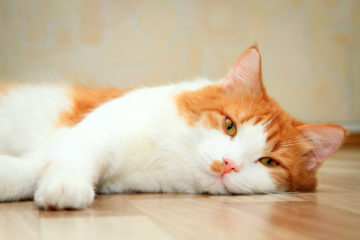 Overweight and obese cats often have soiling and dermatitis under their tails as well. There is an unpleasant smell coming from your cat. With rare exception, cats do not need to be bathed. A foul order of any sort should be investigated by your veterinarian. Bite wound abscesses may produce foul smelling drainage. Dental disease and kidney disease may cause your cat’s saliva to smell bad and this odor can be transferred to their coat. Ear infections can produce a bad smell as well as waxy debris. Oral tumors produce particularly found smelling saliva. Any odors coming from your cat’s mouth needs to be evaluated by your veterinarian. Elderly cats frequently neglect their grooming. This is likely due to arthritis, or degenerative joint disease, which affects over 90% of cats over 12 years of age. Dental disease, changes in coat texture and shedding cycle, and other diseases such as hyperthyroidism and diabetes can also contribute to lack of grooming in older cats. Pay particular attention to the nails of older cats. Overgrown nails are easily overlooked. Acute illness, increasing or weight, dental disease, poor nutrition, parasites, infections, and chronic illnesses can all cause your cat to appear messy. If you notice any of the symptoms listed above, contact your veterinarian to develop a health care plan for your cat.